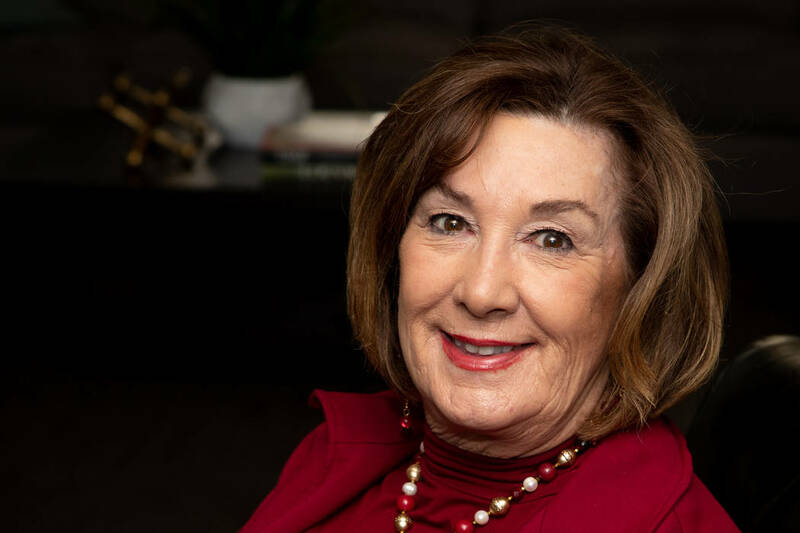 Carpenter, the managing broker for the Summerlin office of Signature Real Estate Group, has taken the helm as the 2019 president of the Greater Las Vegas Association of Realtors. A self-described Navy brat, Carpenter never had a home for long and attended 13 schools, including one on Midway Island. When she married her husband Jerry, an Air Force pilot, they never stayed in one city for long. They were married in Austin, Texas, and have lived in Florida, Virginia, Alabama, and Alaska over the years. There were even three separate stints in Las Vegas starting in 1983. That’s when Jerry got orders for Nellis Air Force Base and decided to buy the couple a home while Janet was in Alaska with their two children. She agreed but only if the home had a large bath and kitchen. It wasn’t what she wanted. The bath was long and didn’t have the vanity space she desired. She called the kitchen a galley in which she couldn’t see her sons Jeff and Jason in the family room. She said she told him she had no desire for that career but changed her mind. Substitute teaching in Alaska paid well but in Las Vegas she couldn’t earn enough to cover day care, she said. Carpenter went to school, passed the test and joined the Americana Group as an agent. She worked there for three years until Jerry was transferred, only to return two other times when her husband was transferred back to Nellis, the final time in 1994 from Guam. Her firm evolved into Prudential Americana where she was a branch manager for four years before she departed. In March 2010, she joined Realty One Group as corporate broker for the northwest office where she managed more than 300 agents. She joined Signature Realty Group in July 2013, and today it has four offices and about 400 agents. In 2006, during the GLVAR presidency of Linda Rheinberger, Carpenter said she wanted to give back to her profession and volunteered to serve on the Grievance Committee that handled complaints against Realtors. That led to service on other committees, and eventually at the insistence of her Realty One boss Dave Tina, who would later become GLVAR president, she ran for a board of director’s slot. “I didn’t want to do it because I was happy with what I was doing, and no one was more surprised when I was elected to the board,” Carpenter said. She’s said she’s glad she ran, having served four years as a director, two years as treasurer, one year as vice president and one year as president-elect. The GLVAR’s role is preserving property rights, supporting charities and dispersing accurate real estate data, Carpenter said. She will be the public voice for the GLVAR when it releases its monthly stats. The Southern Nevada housing market has been softening. In its most recent report, the GLVAR said November prices dropped from October as part of a flattening, even though prices were up 13 percent from November 2017. Home sales in November were down 11.6 percent from November 2017, and the housing supply has increased to more than 7,000 homes without any offer. While inventory has increased and sales have slowed, Carpenter said she remains optimistic about Las Vegas and the housing market even though it has slowed. Carpenter said inventory is increasing because a lot of buyers looking for more affordable homes are getting priced out. Some are worried that if they sell they won’t be able to find the home they like because of the appreciation. In 2019, homes priced under $350,000 will have the most appreciation, while those priced between $350,000 and $700,000 won’t see as much uptick, Carpenter said. Homes priced $1 million and above should be “pretty flat,” she said. Any ongoing increase in interest rates will slow sales, but Carpenter said she’s not concerned at this time. When she started in real estate, interest rates were 17 percent, and they were 10 percent when she bought her second home. “When people are getting 5 percent now, how wonderful is this in comparison,” Carpenter said. Her biggest concern, she said, is that affordability is “starting to become an issue in Vegas” because salaries haven’t kept up with appreciation. There’s no concern, however, of a housing bubble like a decade ago when the peak of the market was $315,000 in 2006, she said. Carpenter said she starts her one-year term with no agenda. There’s been a lot of changes in recent years with committees added or eliminated, and the board will continue to assess how that’s working and whether changes are needed, she said. The GLVAR has about 15,000 members and adding about 150 to 200 a month, Carpenter said. That monthly trend should continue but with annual dues forthcoming in January the overall membership will drop because of retirements or inability for some agents to make a living, she said. Some 10 percent of Realtors earn about 90 percent of the money, she said. The GLVAR had about 17,500 members at its height more than a decade ago. The annual dues are $645 and there are two separate $300 payments in the spring and fall for access of the Multiple Listing Service.